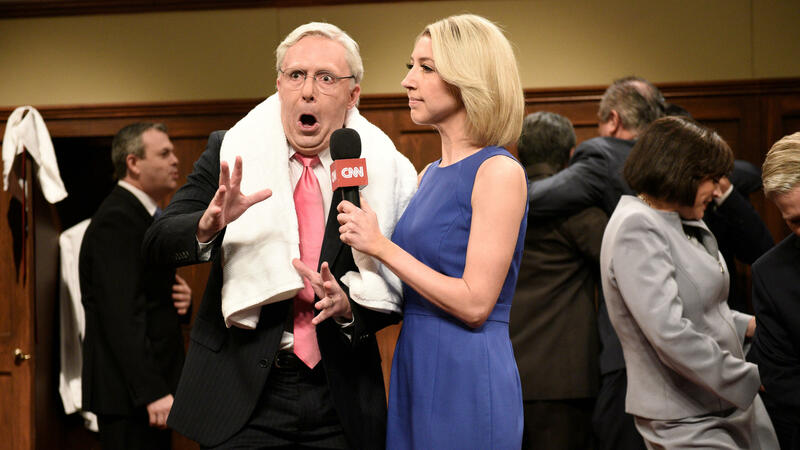 Beck Bennett as Sen. Mitch McConnell, Heidi Gardner as Dana Bash on Saturday Night Live on Saturday. As CNN's Dana Bash (Heidi Gardner) reported from the locker room celebration, Senate Majority Leader Mitch McConnell (Beck Bennett) proclaims, "Republicans read the mood of the country and we could tell that people really wanted Kavanaugh. Everyone's pumped — from white men over 60 to white men over 70." Kate McKinnon was back as Sen. Lindsey Graham: "We made a lot of women real worried today, but I'm not getting pregnant so I don't care!" Cecily Strong took on Susan Collins, the Republican senator from Maine who had reportedly been undecided on Kavanaugh's nomination, though offered a lengthy defense of him in a speech Friday. "The last thing I wanted was to make this about me," Strong's Collins says. "That's why I told everyone to tune in at 3 p.m. So I could tell all my female supporters: Psych!" "Listen, I think it's important to believe women, until it's time to stop," she adds. Later in the scene, McKinnon's Graham alluded to the protesters that have gathered in Washington, D.C. in the past few days to oppose Kavanaugh's nomination. "This one is about the fans. They've been there for us all week, cheering and screaming outside of our offices," he says. " ... And I know that they agree with us because they're shouting out, 'Me too.' "
Later in the show, a brief prerecorded scene wondered what would happen if the "presidential alert" that millions of Americans received Wednesday were to resemble the president's tweets: "Puerto Rico is fine now! I guess the paper towels worked!" Another: "Warning: White men are under attack." Another recorded video waded into the Texas senate race between Ted Cruz and Beto O'Rourke. While supporters chalk up progressive challenger Beto O'Rourke's "cool" factor — like when a video circulated on social media of the Texas congressman skateboarding in a parking lot, or when Texas Republicans mocked his earlier years as a punk musician — SNL imagined a Ted Cruz rally's attempt at "cool." "Maybe Ted Cruz can't sound cool, but I bet we can make him look cool!" says this week's host Awkwafina, in character as a "hype woman." Last week, Kanye West made headlines for, among other things (like wearing a Perrier costume), making a speech after the show had gone off the air in support of President Trump. West wore a "Make America Great Again" hat and said, "They bullied me backstage, they said don't go out there with that hat on." Cast member Pete Davidson took to the Weekend Update desk this week and said that wasn't true. He started off by saying, "A lot of people thought [Weekend Update co-anchor Michael] Che should be the one to talk about Kanye. But we discussed it, you know, because Che's black. But like, I'm crazy, and we both know which side of Kanye is at the wheel right now." Davidson debuted a new hat: "Make Kanye 2006 Again." The show is back on Oct. 13 with host Seth Meyers and musical guest Paul Simon.